Look for a carrier that is comfortable for both you and baby. Try out the ones you’re thinking of buying, rather than asking a friend for a recommendation. A carrier that fits your friend well may not fit you. Carriers can be used until your baby is about 45 pounds, though you may find that they may feel too heavy and uncomfortable even before your baby reaches that weight. At that point, it’s time to try a stroller. Make sure your carrier is the right size for your child’s size and age. Beware of carriers that you cannot manipulate on your own. It’s unrealistic to think that you will always have a spouse or companion with you to help get your baby in and out of the carrier. If you plan on sharing the carrier with someone else (like a spouse or babysitter), make sure it adjusts to fit everybody who’ll be wearing it. Carriers made of fabrics that are easy to wipe clean or that can be put in the wash are best. Front carriers are made up of two shoulder straps supporting a fabric seat. They are typically designed so that your baby can ride on your chest, facing inward or outward, and have adjustable settings to help distribute your baby’s weight across your back and shoulders. 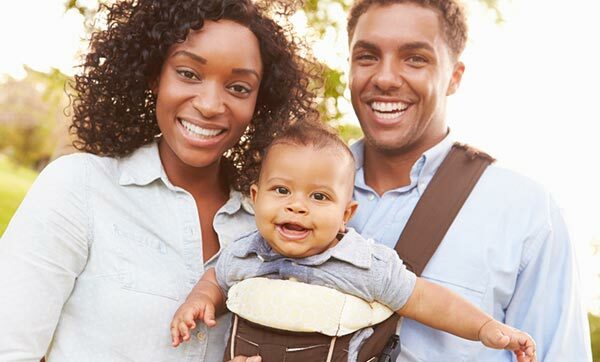 Front carriers are good for newborns and can hold infants up to 30 pounds, though many parents find that a backpack works better once your baby exceeds 15 or 20 pounds. Front carriers allow baby to face outward and see the world while still being close to you, which may be soothing and cut down on fussiness. The snug fit of front carriers makes them warm, so pick one with breathable fabric that won’t make baby too hot. Use a carrier with well-padded shoulder and waist or hip straps to save your shoulders and back from strain. Make sure your carrier has a sturdy headrest that will support a sleeping baby’s neck and head and that leg holes are banded with soft fabric that won’t irritate a baby’s skin. Find a carrier that is easy to slip on and off by yourself and that won’t require you to wake baby to do so. It is awkward to breastfeed a baby in a front carrier. If this is something you plan to do, you might want to consider a sling instead. 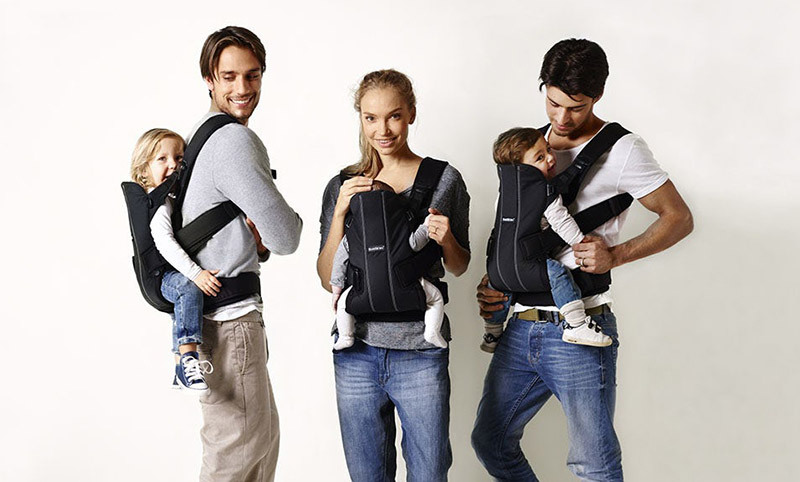 Parents and reviewers have been raving about the classic BABYBJORN Baby Carrier for years now, and with good reason. It is a great, easy to use carrier that fits most parents perfectly. We love it. Slings are simply a wide swath of fabric that hangs across an adult’s torso and is supported by one shoulder strap. They allow infants to lie in a fetal position or to face outward, and older babies may enjoy straddling the wearer’s hip. Slings are best for carrying newborns under 20 pounds around the house or for short distances. As infants grow, they will become cramped and uncomfortable in a sling. 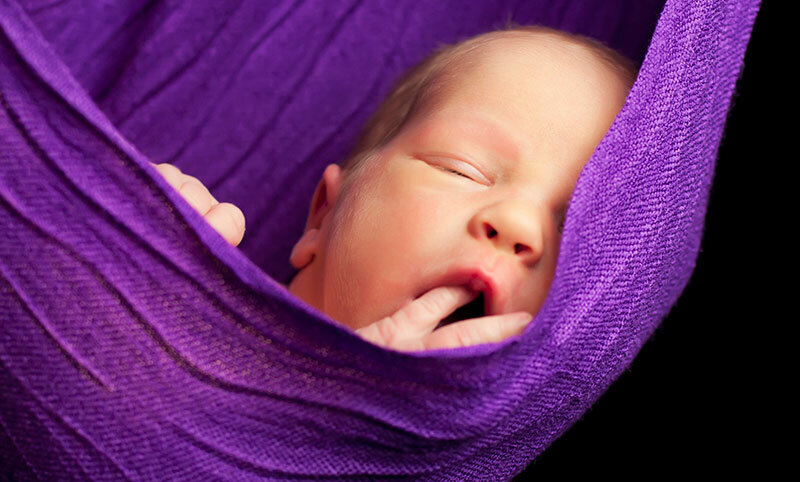 Slings are incredibly comfortable for the wearer and allow infants to rest in a comfortable, natural sleeping position. The soft material of a sling wraps around the infant, simulating the coziness of a swaddling blanket, and the swaying motion may help them sleep. Slings are the easiest type of carrier in which to breastfeed. Make sure the strap of your sling is comfortable and well padded. Some slings can be bulky due to the large amount of fabric they contain. Watch out for slings that have an unnecessary amount of fabric in order to cut down on some of the bulk. Cotton and other breathable fabrics are best for slings, which will be warm due to baby’s close proximity to the parent. We have a few favorite slings, but our #1 is definitely the Boba Baby Wrap. A baby backpack carrier is similar to a backpack used for camping except that a seat for baby takes the place of a storage compartment for gear. The frame and straps will help distribute your baby’s weight evenly over your shoulders and hips. A baby is old enough to ride in a baby backpack when she can sit up on her own (about 5 to 6 months). Until then, it’s best to stick with front-style carriers. Backpacks are sometimes difficult to get on and off without help from a second person, so they may not always be convenient if you’re running errands that require taking the pack on and off at each location. Practice solo loading and unloading of baby until you get the hang of it. It is especially important to make sure a backpack fits correctly and is adjusted properly. Look for a lightweight backpack with an adjustable inside seat and a harness that will safely strap baby in, ideally one that fits across baby’s chest and shoulders. Choose a model that has a stable support stand that allows you to prop it up while putting your child in or taking them out. If you’re planning on hiking and camping with your baby, get a backpack that comes with a protective canopy to shelter him from the elements. 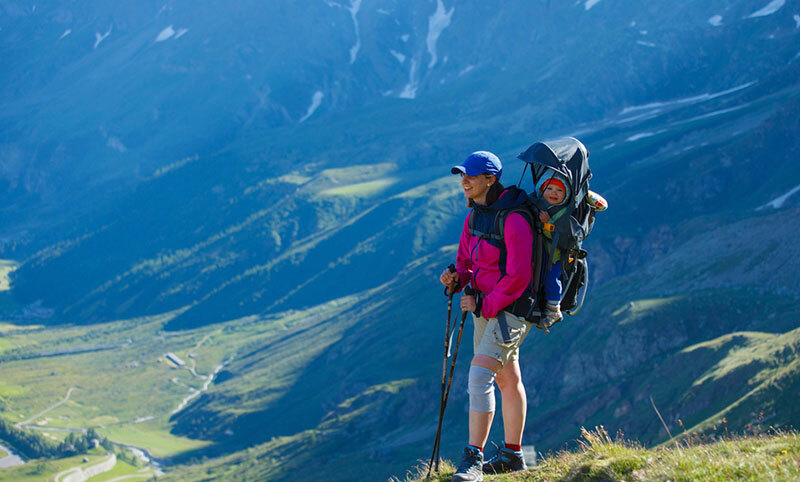 For heavier children or for hiking, look for a model with a waist belt, which will transfer some of the weight from your shoulders to your hips. A model with roomy, easy-to-access pockets for stashing baby gear will be most convenient. If you are looking to take your little ones hiking, we highly recommend the Kelty Tour Child Carrier. It is solid, easily adjustable, and recommended by many parents. Carriers should not be used while driving, jogging, skating, or riding a bike. Frame-style carriers should be used only when baby can sit unassisted. When picking something up while wearing a carrier, always bend at the knees so that baby doesn’t fall out. Do not cook while baby is in the carrier. Stay off stools and ladders while wearing a carrier. Do not reach for overhead items that could fall and hit baby on the head.